Born in Adigrat, Tigrai on 18, April 1969. He became a Salesian on 24 September 1991. He was ordained a priest on 18 April 1999. He holds a licentiate in Philosophy from the Salesian Pontifical University in Rome and had been the Rector of the Post-novitiate house at Adigrat before he took charge as the Provincial of the Province of AET on 24 July 2013. 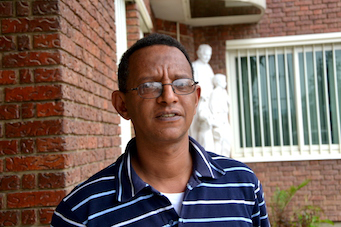 He becomes the first Ethiopian to become the head of the province since the Salesian presence began in Ethiopia in 1975. Born in Italy on 26 January 1948. He made his First Profession in the Salesian Congregation on 16, August 1965. He was ordained a Priest on 22 September 2012. He was nominated as the vice-provincial of AET in July 2013. Born in Italy on 15 July 1951. He made his First Profession in the Salesian Congregation on 16, August 1968. He was ordained a Priest on 30 September 1978. He was appointed as the Economer of AET on 24 January 2014.